The snow plow controller is a vital aspect to a plow system. It is the only source of real interface you will have with your snow plow, so it’s important that it is effective and easy to use. It’s crucial to find the controller that works best for you. Snow plow manufacturers typically offer a button handheld control, like the SmartTouch 2 Handheld Control or a joystick control. 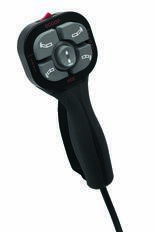 BOSS has developed an additional controller option called the Pistol Grip.The pistol grip is a combination of the handheld and joystick controller with raise and lower buttons, and a thumb controlled joystick for the center. It’s important to find the controller that fits your needs and preferences. The pistol grip controller was created and tested after researching aviation joysticks, video game controllers, and other control devices that are used for long durations of time. Taking all of these designs into mind, the NGE pistol grip controller was ergonomically built with custom features for both a vee and straight blade plow operation. 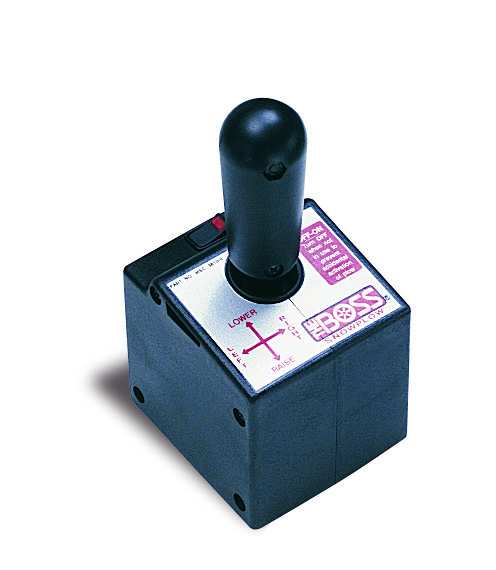 The pistol grip controller has an 8 position joystick to control plow movements, trigger buttons to control lift and lower, and power and mode buttons. 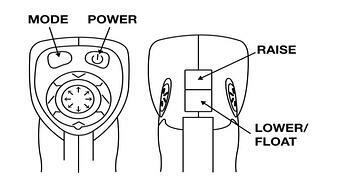 The power button turns the controller On/Off while the mode button will offer future functions. RAISE: To raise the blade of the plow, press and hold the Upper Trigger Button until the blade is fully raised. You can also double-tap for Rapid-Up movement. LOWER: To lower the plow blade, quickly press and hold the lower trigger button. FLOAT: The float feature allows the plow blade to follow the contour of the ground for plowing use. The plow can be put into float mode by holding the lower trigger button, or by quickly pressing the lower trigger button twice. ANGLE LEFT: To angle your snow plow to the left, use your thumb and push the joystick to the left until the plow is fully angled. ANGLE RIGHT: To angle your snow plow to the right, use your thumb and push the joystick to the right until the plow is fully angled. VEE: To create the vee shape with the vee plow, use your thumb and pull the joystick to the down until the blades are fully retracted. SCOOP: To create the scoop shape with the vee plow, use your thumb and push the joystick to the up position until the blades are fully extended. SLEEP MODE: If the controller is ON but is inactive for 20 minutes, the automatic sleep mode will be activated. 20 minutes is the factory setting, but this can be adjusted as explained below in the configuration section. The individual functions including, angle left, angle right, vee (vee blade plows), and scoop can all be used simultaneously with the ‘Raise/ Lower’ direction buttons ensuring ease of use. 1. One controller for both straight and v-plows. The pistol grip controller can be used for both straight plows and v-plows. There are two clear discs that come with the pistol grip controller. Depending on whether you have a vee or straight blade plow will determine what disc you need. The vee plow disc allows for the joystick to move in 8 directions and has 8 rounded rivets in the center. The straight blade disc only allows the joystick to move in 2 directions and has an oval cut out in the center. 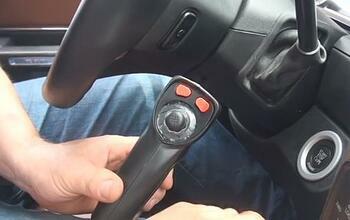 To change the disc, on the center of the controller, take off the thumb joystick. To remove the existing disc, a simple screw driver or pry tool can be used. Take the disc you would like to attach and find the small alignment tab located on the outer edge of the disc. Position the alignment tab to point to the base of the controller. Once you have the alignment tab in place, snap in the clear disc. Take the thumb joystick and snap it back onto the center of the controller and you are ready to go! 2. Adjustable sleep mode. Sleep mode disables the controller after so many minutes of inactivity. The factory setting for sleep mode is 20 minutes. You may want the plow to go into sleep mode quicker to eliminate accidentally activating the control while driving between contracts. The new controller will allow the setting to be changed to 20, 15, 10, or 5 minutes. 3. Enable and disable the express ‘rapid up’ feature. This feature gives the power to the snow plow contractor to enable or disable the ‘rapid up’ feature depending on the plowing conditions. For instance, when plowing near soft ground, or pushing snow onto a lawn or landscaping, you may only want to raise the plow slightly to disable float mode and eliminate tearing up the grass. When moving the plow up, you could accidentally engage ‘rapid up’ (which is engaged by pressing the ‘up’ button twice in quick succession) causing the plow to move up quickly resulting in you possibly losing all of your snow from that push. To eliminate that possibility, the pistol grip controller allows you to disable the ‘rapid up’ feature or enable it depending on the snow plow contract. To customize these configuration functions, follow the instructions in the pistol grip manual or watch "HOW TO CHANGE THE CONFIGURATIONS ON A PISTOL GRIP CONTROLLER" to learn how to configure your controller for your snow plow needs. The pistol grip controller also offers reliability and safety features. The controller is tethered to your truck. This means the controller is always plugged into the truck so that you will never have a dead battery on the controller. It will always be charged and ready to go for the next time you head out snow plowing, even when it’s left in the cold truck. This saves you the frustration and time of having to charge up a controller in the midst of a storm. The controller is also tethered to the truck for an added safety measure, meaning you cannot activate it outside of the truck. This eliminates the chance of accidentally activating the controller outside of the vehicle while you or others are standing around or under the plow. The pistol grip controller can only be used with the BOSS Next Generation Electrical System, so be sure to keep that in mind when considering purchasing a controller. When you’re considering all of the models of controllers available, be sure you test out and feel how the controller works with the size of your hands and the ease of buttons/ joy stick to control the plow. These can all affect your snow plowing experience. Find a controller that puts the power in your hands, is reliable, and easy to use.